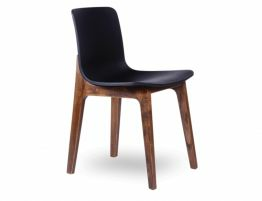 The Ara Timber Dining Chair is one of our most comfortable chairs. The Ara has a small dip at the bottom of the seat which supports your spine, making it incredibly comfortable. 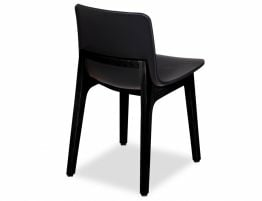 The black seat is stylish and durable, and will suit almost any space and style. Ara's legs are made from a solid ash timber which has been stained a deep and beautiful tone of walnut. Ara is perfect not only for dining settings but for office spaces, waiting rooms and any place where you need a comfortable and stylish seat. 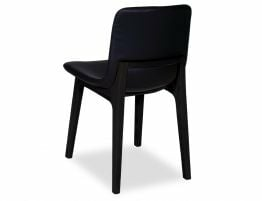 This timber framed dining chair has a contoured seat that is made from plastic, leaving less room for mess. 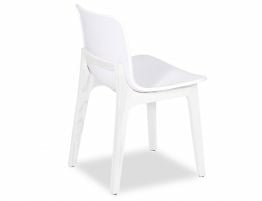 The plastic seat means that it is easily wiped down and maintained within your space, allowing this chair to integrate well into spaces that regularly host children. 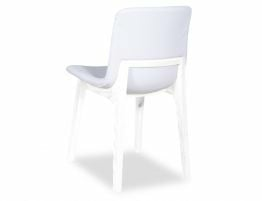 This being said the Ara is one of our most popular chairs both residential and commercially. Kick back or run your meeting in style with the Ara dining chair.